Many of you readers will recognize this error message. This error message is telling you that a query took too long to execute and caused this exception to be thrown. And unless you’ve changed the CommandTimeout property on your SqlCommand to a different value, then “too long” means longer than 30 seconds. Throw an exception to be handled by the application. 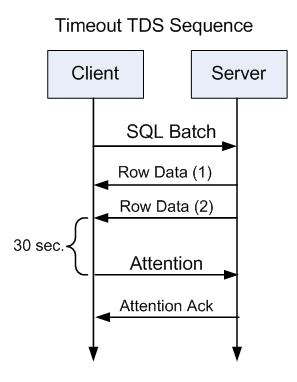 So if the query has 30 seconds, does the stopwatch start when I send the query to the server? Does the stopwatch stop when I get the first row? What if the client spends time processing data instead of fetching rows from the server (like when saving data to disk). Is that “on the clock”? 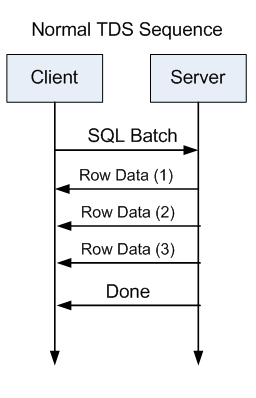 Why do I sometimes see timeouts on queries after more than 30 seconds? Why do I sometimes see queries not time out even though they take longer than 30 seconds? Note: This property is the cumulative time-out for all network reads during command execution or processing of the results. A time-out can still occur after the first row is returned, and does not include user processing time, only network read time. Using that note, we know that processing time is not “on the clock”. The timer is only running down when the client is waiting for a response from the server. See how the row data response has been split into three packets? In testing I see that these packets can be 8 kilobytes in size so these packets usually contain several rows. Although the official docs say the time is cumulative, in practice, I only see timeouts when 30 seconds has elapsed between packets regardless of wait times for previous packets. So based on this, what do we know? 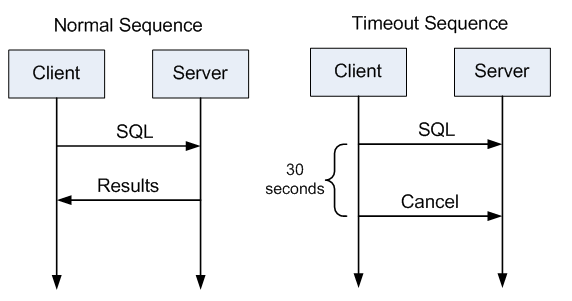 The timeout stopwatch starts ticking when the query is sent to the server. It also restarts when the client needs data from the next packet of row data. The stop watch stops when the client receives a packet from the server. If the client takes a long time processing data sent from the server, this will not impact timeouts (I didn’t know this fact until recently). the server is responding slowly but steadily (i.e. without gaps between packets that exceed the timeout period). 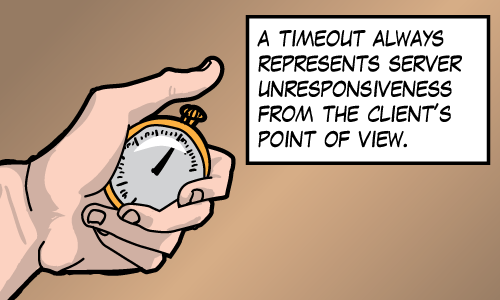 In short, a timeout always represents server unresponsiveness as seen by the client. Thank you for the detail explanation and diagrams illustration! It certainly cleared my doubts on the CommandTimeout Property. I didn’t know it was possible to write an interesting blog post on a TDS sequence… but you’ve done it! This error seems to be running for a while without conclusion. So with this can we determine that there could be an issue with network delay. Kindly provide the solution for this. Don’t blame the network just yet. I would consider a lot of other reasons for timeouts before I would consider problems with the network. You didn’t provide enough information to let me provide a solution, but most often, a timeout means that a query is performing a lot of work and is simply long-running. I use sp_whoisactive on the server to find active long running queries. And I use sp_whoisactive @get_plans = 1; to learn about why a query is taking so long. That’s where I would start. But starting is just the first step. Learning to tune or avoid long running queries is an important skill, but it takes time. I wish you good luck. I didnt conclude network issue. Anyways thanks. One thing i noticed is, the SP runs fine when ran from SSMS, but fails from app end, Also i ran profiler to see whether the procedure hits the db. I could see SP started in DB server sent from app server, but then fails. So my colleague said paramter sniffing could be issue, i dont think so. I think it’s important to get the query plan of the query (and not necessarily from SSMS). These links might not help you directly, but they might give you ideas. If you have further problems, shoot me an email.